VATICAN CITY (CNS) — To ensure engaged couples are entering into a fully Catholic marriage and remain committed to their vows for life, they must be prepared properly beforehand and supported afterward, Pope Francis said. Addressing members of the Roman Rota, a tribunal handling mostly marriage cases, the pope said the church cannot ignore that there is a “widespread mentality” that is convinced eternal truths do not exist and, therefore, that many young people approaching the church for marriage do not understand what the sacrament is and that it is for life. “Such a context, lacking religious values and faith, cannot help but condition matrimonial consent,” one of the essential conditions for a Catholic marriage to be valid, the pope told the Rota members Jan. 21. The response of the Catholic Church, he said, must be to provide serious preparation for engaged couples and support that would help newlyweds mature in their vocation. “The objective of this preparation consists in helping engaged couples to know and live the reality of the marriage they intend to celebrate so that they may do so not only validly and lawfully, but also fruitfully,” he said. Educating young people so they rediscover marriage and family life according to God’s plan, he said, is a first “remedy” to situations where sufficient preparation is lacking. “In this spirit, I would like to reiterate the need of a ‘new catechumenate’ for marriage preparation,” he said. A second remedy, he continued, is the church’s presence and formation after marriage to encourage newlyweds in their lives together. The Christian community is “called to welcome, accompany and help young couples” and care for their spiritual life through the parish’s pastoral ministry, he said. “Often times, young couples are left to themselves, perhaps for the simple fact that they are seen less in the parish; this is especially true after the birth of children,” the pope said. Prior to their meeting with Pope Francis, the members of the Roman Rota celebrated Mass with Archbishop Angelo Becciu, a top official in the Vatican Secretariat of State, to inaugurate the Vatican court’s judicial year. 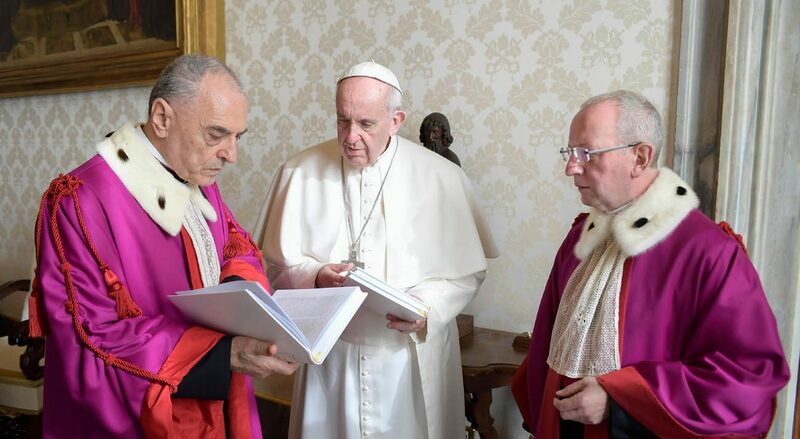 “The ministry you fulfill in the pope’s tribunal puts you daily in contact not just with letters, but with people marked by human and marital failure; they are awaiting answers of truth and justice by the church,” the archbishop said.